Product #21086 | SKU TAC-2R | 0.0 (no ratings yet) Thanks for your rating! 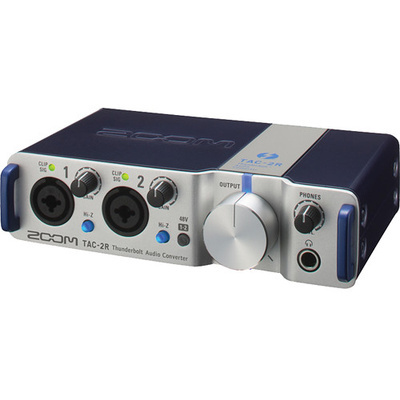 The TAC-2R from Zoom is a two-channel Thunderbolt audio interface that offers near zero latency and up to 24-bit/192 kHz resolution. The compact and robust housing makes the interface perfect for studio and field recording of microphones and instruments, for onstage playback, and audio streaming, and with its dedicated MIDI input and output connectors, it can even serve as a stable MIDI interface. The unit features dual XLR/TRS combo inputs to the preamplifiers and two balanced 1/4" outputs. Phantom power is available for use with condenser microphones and the interface is bus powered, so no AC adapter is required. The headphone output has a dedicated volume control and a free Mac application is available for setting mix parameters and adding effects such as reverb and echo.